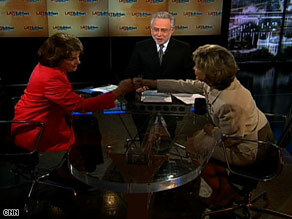 Feinstein and Hutchison share a fist bump. I just want to take this opportunity to beg all Obama supporters to resist arugering with Hillary's I do know that it can be extremely hard to do, but it really serves no purpose. Many of them will vote for Obama once they have the time to settle down and reason things out, but if they do not then that will be OK too, there is enough of us that have stood by him and millions that have had buyers remorse since voting for Hillary so that number is not as much as they are claiming, plus we must consider the Independents that were not allowed to vote in their state's primaries, then there are thousands of of young people that will becoming of age before Nov. that were not aware that they could have voted in Primaries. Also believe it or not many did not vote in Super Tuesday because they did not know who Obama was and did not believe he would have a chance, many that are sorry that they did not vote. There are those that are in Mi & Fla that will vote for Obama , then let's not forget those Republicans that will be voting for Obama. There will be EX HILLARY SUPPORTERS that WILL VOTE OBAMA, I AM ONE OF THEM! Hillary supporters are acting like most that are not used to have power and now that they THINK they have it, they want others to beg and sweat over them, I will not, I believe it best to ignore them at this point, allow them time to calm down, but please STOP begging and arguring with them, they will have to reason this out on their own just like the MILLIONS OF US THAT DID! IT'S TIME TO GET OVER IT MOVE ON, AND GROW UP! BUT FOR GOD'S SAKE SHUT UP ABOUT IT ALREADY! YOU ARE NOT THE ONLY ONES DISAPPOINTED, I READ A COMMENT FROM A 15 YEAR OLD THAT HAS ALREADY REASONED IT OUT AND SOUNDS MORE MATURE THAT MOST GROWN UP IN THESE BLOGS STILL CRYING AND TAKING A TANTUM! ENOUGH ALREADY! EITHER THESE PEOPLE ARE TOO STUPID TO REASON WITH ANY WAY OR THEY ARE JUST ANGRY AND WILL COME AROUND EITHER WAY IGNORE THEM FOR NOW! END THE WAR, BRING OUR TROOPS HOME! HELP OUR ECONOMY!!!!!!!!!!!!!!!!!!!!!!!!! Marty, you are right the fist bump has been going on for years and you can't attribute it to the Obama's, but THEY are going to make it popular now. The Obama's are a breath of fresh air. From Washington State, we love you Barack and Michelle!!! I cannot believe that the media is making such a big deal about something so small. Even crooks and other less desirable people use the so called "fist bump" Why isn't the media making a big deal about them??? Ever since Barack Hussein Obama hit the airway, the media has made him their "Golden Boy". The media slammed Hillary Clinton and praised Obama, what a joke! oh yah way to go obama style. The "fist bump" has unfortunately become The Macarena. It has officially become "dorky".And if I see Obama, Michelle and the rest of Obama's delegates hip hop.....I will puke. The reason they're reporting is that Fox News reported on it and obliquely referred to it as a "terrorist fist bump." Obviously Dianne Feinstein is trying to eliminate any chance of that characterization being seen as remotely valid. has no news they are like People magazine..
CNN is clinton national news..
CNN needs to start reporting on that. Inspiring speech HILLARY! but, I will not vote for Obama in November. I have already changed my party affiliation and YES I am voting for McCain and so is my family. We want a qualified candidate, and not an empty suitcase. The ignorance of some people on these CNN comment boards is completely intolerable. I cannot understand why people who were once Hillary Clinton supporters would just suddenly jump ship on the party she is a member of, and ignore her call to action to get behind the other candidate. It's ridiculous. It's this whole sense of American entitlement that we suffer from collectively; a real childish attitude. "If I can't win the game, I'm taking my ball and going home." There are even people posting here saying "I'll vote for McCain just because he's NOT Obama. McCain will be terrible, but my voice will be heard." What a bullheaded and stupid thing to say. It's like cutting off your nose to spite your face. Don't vote for one candidate or the other in order to piss people off; vote for somebody because you believe they're the best for the job and have a clear vision of what needs to be accomplished. Whether McCain or Obama has more experience is really a moot point, in my opinion. NOBODY has "experience" in this job until they are ACTUALLY the President of the United States. I certainly won't tell you who to vote for – we are all entitled to our opinions – but I WILL say that this nasty left turn over Clinton's supporters going over to McCain's side shows a huge immaturity in the voting public. TO Molly & Others like her, I hope the voters who can't afford gas, health care, lose love ones in this war and high food cost, find you, because if they that DUMB to listen to a person that say she was for Clinton, but not Obama is a person who has prejudice issues and need help. Write Hillary name, but for us who needs financial help, we can’t ask her for any money, Hillary has millions, what do you have? I am a Obama supporters, and yes, if Hillary was the nominee, I would vote for her in a second, she's DEMOCRATES- RIGHT...I AM A DEMOCRATE..................BE true to yourself if not anyone else…. We who are suffering from the Bush administration are getting tired of you voters who think it's all about YOU, when it should be about ALL of US. Some of us voters have suffered enough, we finally have a chance to get help from a demarcated president, and all you can think about is proving your. Instead of being on here trying to get someone to follow your lead, you should be thinking about OTHERS while you cast your VOTE the nominee. When you say you are going to teach the DNC party or Obama a lesson, how, he still will be a Senator, lawyer and more? After November they all (including Hillary) will still be able to AFFORD gas, make ENOUGH MONEY to survive any type of economy woes, outstanding health insurance for entire family, still have their JOBS, continue to have MILLIONS of dollars in their accounts. The only lesson you will teach anyone, including yourself, is that you are a selfish voter. Okayyyy, now we get to see grown, professional woman doing the ghetto bump! This has been around for ages and now its gonna be the "only" semi handshake to use and if you dont your a racist!!! Anybody have a house I can rent in Australia???? I think is is cute. Maybe you should try it. What's ghetto about a fist bump? What is ghetto anyway? Explain that to me! Just what we need. A Ghetto govornment and president. We often don't know what to say out of our mouths. However, when the tables turn we don't know what to do. DAN – "How cute a hand shake people do not to give each other the flu and now as if the Obamas have invented it, isn't it cute, get real this is nosiating"
What's nauseating is your inability to put together a sentence, have any sort of grammar, or spell. untrue statements used day after day while bragging on McShame . This is a hang out for Republicans they want more war and end Roe v Wade actually McShame has forgotten what he said 5 minutes ago . After reading all this crap i say bump this.